At Norton Creek Farm, we raise free-range eggs, chickens, turkeys, and pigs for local customers like you. Nestled 16 miles from Corvallis in Blodgett, Oregon, our farm raises poultry the old-fashioned way—outdoors on green grass pasture. You’ll discover that our grass-fed, free-range products taste better because they’re raised on pasture and handled with care. The proof of the pudding is in the eating, so when you try our products, you’ll keep coming back for more! We’re no spring chickens ourselves — we started in 1996 and are the longest-standing grass-raised chicken provider in Oregon. We’re also the longest-standing egg vendor at the Corvallis Farmers’ Markets, and are licensed by the State of Oregon. Some of our customers are gourmets, others are health-conscious, or used to raise chickens the way we do, and, like us, all of them love great-tasting meals! Corvallis has a year-round (almost) farmer’s market season, with an indoor winter market and an outdoor market the rest of the year. We’ll be there! Indoor Winter Market (mid-January through mid-April): Saturdays 9:00-1:00 PM at the Benton County Fairgrounds. Just follow the signs. Outdoor Market (mid-April through mid-November): Corvallis Farmers’ Markets, Wednesdays and Saturdays from 9:00 AM to 1:00 PM at First and Jackson Streets in Corvallis. Look for the booth that says “Norton Creek Farm” and see what we have to offer! Our farm is in a beautiful setting, the Norton Creek valley, with 37 acres of land. Because much of our land is hilly and we get 60-90 inches of rain a year, we avoid erosion by keeping it in permanent pasture. We are building up the fertility of our land by raising animals who give back more to the land in manure than they take from it in feed. This trick is accomplished by using animals that eat pasture plants as an important source of nutrition, but get most of their actual calories from purchased feed. The feed turns into manure which enriches and deepens the topsoil. Such species include chickens, turkeys, and pigs. Our farm is getting greener all the time, and the grass is starting to stay green through droughts. See what the local paper had to say about our farm! Our free-range hens are scattered in small groups across wide areas of pasture. This keeps the pasture in good shape and makes the hens happy. Chickens that eat lots of green plants lay eggs with deep orange yolks and greatly superior flavor. The hens are loosly confined with a low, two-wire electric fence, so low that we can step over it without difficulty. This is the same kind of fence gardeners use to keep raccoons from their vegetables, and it also serves to keep predators away from the hens. Our eggs are not only great-tasting (try them side-by-side with whatever you’re eating now, and you’ll see! ), they’re highly nutritious. 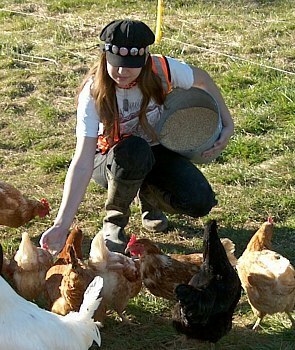 We tested very well in a roundup of pastured eggs done by Mother Earth News in 2007. We collect eggs twice a day and refrigerate them immediately. We use our 1960’s vintage Aquamagic egg machine to candle, wash, sanitize, dry, and grade the eggs in a single operation. Our eggs are sold year-round in Corvallis at Richey’s Market and Albertson’s, and in Blodgett at the Blodgett Country Store. We also sell them at our booth in the Corvallis Wednesday and Saturday Farmers’ Markets between April and November. Our broilers and turkeys are raised in a kind of home-made hoop house that Karen invented. The pens are floorless and are moved to a new patch of grass every day. This leaves their manure behind, fertilizing the pasture, and gives the birds a chance to forage for bugs and fresh pasture plants without letting them loose. Fresh pasture plants give our broilers and turkeys their superior flavor. Broilers can’t be let loose because they’re too young to know the ropes (they are butchered at eight weeks). They literally can’t be trusted to come in out of the rain! Our free-range hens are older and wiser, and are allowed to run loose. Turkeys can’t be let loose because they wander away and are never seen again! We butcher our poultry in our on-farm, licensed processing facility and deliver them to customers at the Corvallis Wednesday and Saturday Farmers’ Markets. We are the oldest licensed pasture poultry operation in the State of Oregon. Our broilers are available from April through November. Our turkeys are available for Thanksgiving. Awesome Farm!!!!! Glad to see old ways still work .